The majority of young adult dystopian and utopian fiction is shaped by the Cold War horror of a collective. It’s rare to encounter a dystopian novel like Suzanne Collins’ The Hunger Games and its sequels, Catching Fire and Mockingjay: what’s targeted isn’t Cold War-era mind control but economic inequality, totalitarian rule, and oppression maintained by brute force. The novels even depict a revolution that overthrows this oppression. More surprisingly, The Hunger Games has been on the New York Times best-seller list of children’s series for 161 weeks (at number one for 128 of those weeks) — and was released as a film in 2012, with the first sequel appearing in 2013 and two more based on the third book planned for 2014 and 2015. A scene from the film adaptation of The Hunger Games. 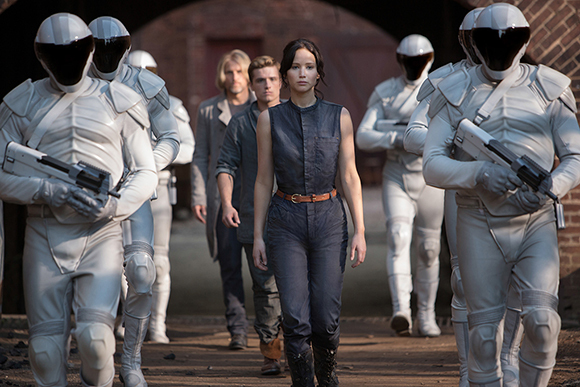 The success of The Hunger Games invites comparison with the recent history of the utopian/dystopian genre. Generations of children, in the United States at least, have read Madeleine L’Engle’s A Wrinkle in Time, in which the Murry children learn the value of individualism and freedom. In Camazotz, the novel’s dystopia, “all of the children on the street bounce their balls in strictly exact unison.” (Hintz and Ostry, 7) The protagonist returns home to the United States, the novel’s real good place, where, despite the suffering experienced by those who are different (in this case, the magical clairvoyants) experience, difference is tolerated. L’Engle won the Newbery Medal for this novel in 1963. To ensure that children in the United States continue to treasure individualism, the American Library Association awarded the 1994 medal to Lois Lowry’s The Giver, assuring it, like A Wrinkle in Time, best-seller status and a semi-permanent position in the classroom. In The Giver, Lowry warns that dystopia results from efforts to construct an ideal society, and that a loss of individual freedom is the cost of utopian striving. Rather than social change, in the third book of the tetralogy inaugurated by The Giver, she prescribes a religious remedy for social conflict. Like L’Engle, Lowry stresses the dangers of mind control, affirms the current U.S. status quo, and discourages collective efforts to improve on it. Other old chestnuts typically assigned to middle and high school students — George Orwell’s 1984 and William Golding’s Lord of the Flies, for example — reiterate L’Engle’s and Lowry’s ideological themes. Some recent young adult dystopian novels offer a more radical perspective on the theme of mind control, demonstrating how technology can enforce the capitalist imperative to consume, for example M. T. Anderson’s Feed. There are now 23 million copies of Suzanne Collins’ The Hunger Games in print according to Scholastic Press, compared to more than five million copies of The Giver. Of the two writers, however, Lowry is the more lauded, and her books have a firm place in the school curriculum: one of my sons read The Giver in the sixth and ninth grades, and the other was assigned the book in two different classes as well! Generically, Lowry’s and Collins’ trilogies are similar, and like most dystopian writers, both promote individual resistance to totalitarianism. But while both depict dystopian societies, their representation of these societies is very different. Collins is more pessimistic than Lowry in assessing the United States — suggesting a dystopian future if her warnings against dangerous tendencies are not heeded — and more optimistic about the possibility of collective efforts to achieve social justice. Despite their generic similarities, then, Lowry and Collins represent two historical antinomies: Lowry Anti-Utopia and Collins Utopia. Jameson reveals the impossibility of Lowry’s claim. While her novels depict the horrors of collective and totalitarian societies, Lowry’s desire to champion the individual while refusing to “make political statements” paradoxically suggests that the attempt to create a truly free society is futile. Potential sources of conflict — love, anger, pain, sexual desire and other intense emotions — have also been repressed. Individuality and choice have been sacrificed for “Sameness.” (94) It is “considered rude to call attention to things that were unsettling or different about individuals.” (20) Color too has been eliminated, symbolizing the sacrifice of that which gives beauty and meaning to life, the cost of utopian desire. “You have never been starving, he had been told. You will never be starving. “Now he was. If he had stayed in the community, he would not be…. Once he had yearned for choice. Then, when he had had a choice, he had made the wrong one: the choice to leave. And now he was starving…. If he had stayed, he would have starved in other ways. He would have lived a life hungry for feelings, for color, for love. The novel, then, refuses to say “No to deprivation” (Bloch, The Principle of Hope, 5), sighing that while it would be nice to eliminate racism, sexism, war and hunger, the cost is too high: feeling, individuality, humanity itself. So, Lowry suggests, we really do live in the best of all possible worlds here in Elsewhere, or in the United States of America. The phrase “waiting for the baby” has more than one connotation here. One is indicated by the phrase “lights that twinkled from trees” — Christmas trees decorated with colored lights, which suggests that Elsewhere is a Christian community anticipating the birth of the baby Jesus at Christmas. The syntax of the sentence also indicates that the “families” are waiting for Jonas and Gabriel (whose name also suggests a messenger of God). In an interview, Lowry claims: “If I had begun to think in literally Christian terms, I would have backed off the project because I have no interest in writing ‘religious’ books. Still, clearly, the theology is there, inherent in the story.” (Silvey) Paradoxically, while the novel’s deep logic is Christian in that virtually all that is revealed about Elsewhere is its Christian character, Elsewhere’s Christianity is only obliquely indicated to the reader, particularly the child reader who may miss the subtle clues. “Elsewhere,” however, offers an alternative only to the dystopia within the novel, not to social reality outside of it. The components of Elsewhere that define it as a refuge are central to U.S. ideology: individual choice, the family, and Christianity. The Giver contains not a glimmer of Utopia, or as Ernst Bloch puts it, “hoping beyond the day which has become.” (10) On the contrary, the dystopia confirms the normative status quo of U.S. society. But an alternative to this hell, the Elsewhere of The Giver beckons: Kira’s father is rescued by its inhabitants when he is injured and left for dead by a rival. He tells her, “There is no arguing. People share what they have, and help each other. Babies rarely cry. Children are cherished.” (205) Thus, the dystopian society’s inhumanity is countered by harmony in the novel’s refuge. As they trade away more of themselves, the villagers decide to close the town to newcomers. This challenges the utopian possibility that Elsewhere appears to offer in The Giver and Gathering Blue. The novel does not depict the political and economic factors that lead to immigration or that might result in hostility to immigrants. Instead, Lowry offers a religious allegory in which the “illusion” that has spoiled this utopian aspect of the Village is vanquished by the sacrificial death of a Christ-like figure, Matty, whose supernatural healing power cures the village of evil at the cost of his own death. Girard rejects atonement as the logic of sacrifice: “Rather, society is seeking to deflect upon a relatively indifferent victim, a ‘sacrificeable’ victim, the violence that would otherwise be vented on its own members, the people it most desires to protect.” (4) Sacrifice, then, prevents uncontrolled violence from “dissensions, rivalries, jealousies, and quarrels” (8) within societies without a judicial system. One wonders what the significance of this sacrifice — or the novel — might be. To assert the fallen nature of humanity: a proclivity to selfishness that makes violence inevitable? A consequent need for periodic sacrifice? This conclusion locates the novel, if not the entire series, within the mythic rather than the historical realm. Conflicts appear irresolvable through political and social change, which is displaced by a universal truth about the selfishness of human nature that ensures social conflict regardless of social organization. This situation requires divine intervention. With this, Lowry deflects any attention to women’s oppression in the United States. Never mind that the United States’ support for mujahideen efforts to overthrow the Afghan government set the stage for the Taliban to take power. Instead, social criticism implicit in the novel is deflected outward: American ideology is celebrated and the United States contrasted with countries lacking the traditional liberties we are supposed to enjoy. In another interview, Collins says that she sees the series as “an exploration of ‘unnecessary’ war and ‘necessary’ war, when armed rebellion is the only choice.” (Italie) Thus, while the media has described her trilogy as antiwar or even pacifist, Collins’ sympathy with those who rebel against their oppressors, even violently, suggests that her position is more complex. 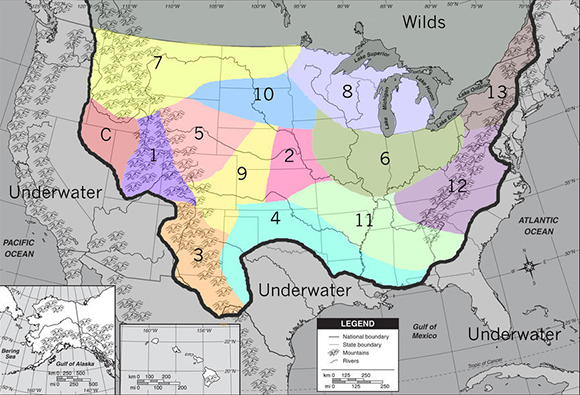 A map representing Panem’s possible location within North America. Map created by Maria Rizzoni. After a failed rebellion against the Capitol in which rebelling District 13 is “obliterated” (18), Hunger Games are imposed upon the 12 remaining districts. The games are a yearly televised spectacle in which 24 “tributes,” a boy and a girl from each district, fight to the death, leaving just one victor alive. This brutal competition punishes the districts for their rebellion while entertaining the Capitol. However, when the trilogy’s 16-year-old protagonist Katniss is selected as a tribute, she teams up with the male tribute from her district, Peeta, and with the aid of their mentor, Haymitch, a District 12 victor from an earlier games, both survive the games. The trilogy’s Hunger Games remind readers of both our own reality television programming and the gladiatorial games of ancient Rome, referred to in the Latin word for bread, panem, which is the name of the country in which the trilogy is set and part of a phrase, panem et circenses (bread and circuses) coined by the Roman satirist Juvenal, describing how the state pacified its subjects by distracting them from political reality and civic responsibility. Reality television functions similarly. One subgenre, the makeover variety (What Not to Wear, The Biggest Loser, Bridalplasty, etc. ), reduces human needs to commodity consumption, while another, initiated by “Survivor,” promotes individualism and the profit motive. In Katniss, Collins depicts a character who challenges the competitive individualism of reality television. At the end of the first Hunger Games competition, Katniss and the other remaining tribute, Peeta, are incapable of killing one another to win. But Katniss initiates a game of brinksmanship with the gamekeepers when she suddenly realizes that the games must have a victor: she and Peeta begin to eat poison berries and are halted by a last-minute announcement declaring them joint victors. Katniss’s motives for her risky ploy aren’t clear, even to her. What is clear, however, is that the Capitol understands her action as resistance, and her pin with a mockingjay is seen as the emblem of the growing uprising. Her commitment to individual self-preservation shifts to political solidarity with those who share her condition. Solidarity among the oppressed is the only force capable of overthrowing the Capitol, which Haymitch reminds Katniss of before her second Hunger Games: “just remember who the enemy is,” he instructs. (Catching Fire, 260). This insight is critical to instigating a rebellion through solidarity. 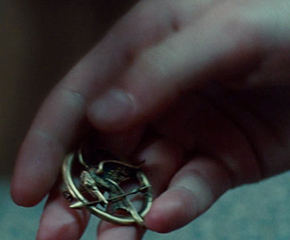 While the trilogy supports the districts’ rebellion, it also represents the cost of their victory. Some of the tributes allied with Peeta and Katniss sacrifice themselves in the second Hunger Games to keep alive Katniss, the symbol of the uprising, and Peeta, whom she has dedicated herself to saving. For example, when Katniss is unable to carry Mags out of a nerve gas attack, Mags walks directly into the gas — which kills her — so that Finnick can carry Peeta. Unlike the religious sacrifice of Matty in Messenger, however, Mags’s action is practical: She believes her sacrifice will preserve Katniss and Peeta and allow them to lead a revolution against the Hunger Games and the Capitol. Her sacrifice is rewarded, and the uprising succeeds. The cost of this success, however, is high. Peeta “clutches the back of the chair and hangs on until the flashbacks are over” and Katniss “wake[s] screaming from nightmares of mutts and lost children” (Mockingjay, 388) Such passages illustrate that war scars even the victors in ways that traumatize them decades later. These passages evoke recent events, as Collins says that “our wars in Afghanistan and Iraq, the popularity of reality television, and the state of the environment have had an effect” on her trilogy. (Tanenhaus) This realistic depiction of the psychological consequences of violence suggests that Collins’ support for violence is limited. Moreover, more than 15 years after the success of the revolution, Katniss fears that what has been achieved can still be lost. Thus Collins, like Lowry, is aware of the ways that efforts to improve society can be betrayed. The sober conclusion of the novel does not offer the closure of utopia achieved. The many proponents of Lois Lowry’s dystopian fiction assert that it empowers readers as “potential agents of positive social change” (Latham, Hanson) and urges them to utopian commitments. (Hintz) However, as I have argued, the ways Lowry’s novels manifest suspicion of utopian projects and project a static view of human nature as selfish and incapable of maintaining a just society without supernatural intervention align her not with the forces of Utopia but those of Anti-Utopia. Collins, in contrast, offers the hope of a better society through the collective efforts of ordinary people. Angela Hubler is Associate Professor of English and Women’s Studies at Kansas State University. She would like to express gratitude to Tim Dayton, Michele Janette, and Naomi Wood for their invaluable support in writing this essay. Susan Stewart elaborates on racial difference in the novel. Bloch, Ernst. The Principle of Hope. Translated by Neville Plaice, Stephen Plaice, and Paul Knight. Cambridge: MIT Press, 1986. Print. Bradford, Clare, et al. New World Orders in Contemporary Children’s Literature: Utopian Transformations. New York: Palgrave Macmillan, 2008. Print. Brenner, Johanna. “Caught in the Whirlwind: Working-Class Families Face the Economic Crisis.” In Socialist Register 2011: The Crisis This Time, edited by Leo Panitch, Greg Albo, and Vivek Chibber. London: Merlin, 2010. 64-82. Print. ———. “A Conversation: Questions and Answers.” Scholastic. Accessed March 7, 2011. Website. ———. The Hunger Games. New York: Scholastic Press, 2008. Print. ———. Mockingjay. New York: Scholastic Press, 2010. Print. DeNavas-Walt, Carmen, Bernadette D. Proctor, and Jessica C. Smith. Income, Poverty, and Health Insurance in the United States: 2011. United States Census Bureau, September 2012. Accessed January 10, 2013. Website. Girard, René. Violence and the Sacred. Translated by Patrick Gregory. Baltimore: Johns Hopkins University Press, 1972. Print. Hanson, Carter F. “The Utopian Function of Memory in Lois Lowry’s The Giver.” Extrapolation 50:1 (2009): 45-60. Print. Harvey, David. “The Crises of Capitalism.” Lecture presented to the Royal Society for the Encouragement of Arts, Manufactures and Commerce, RSA House, London, April 26, 2010. Accessed January 1, 2011. Website. Hintz, Carrie, and Elaine Ostry, eds. Utopian and Dystopian Writing for Children and Young Adults. New York: Routledge, 2003. Print. Italie, Hillel. “Suzanne Collins Completes The Hunger Games.” Associated Press, September 23, 2010. Accessed January 1, 2011. Website. Jameson, Fredric. The Political Unconscious: Narrative as a Socially Symbolic Act. Ithaca: Cornell University Press, 1981. Print. ———. The Seeds of Time. New York: Columbia University Press, 1994. Print. Jordan, Tina. “Suzanne Collins on Writing a ‘Hunger Games’ Movie: ‘You Have to Let Things Go.’” Entertainment Weekly, February 24, 2011. Accessed February 24, 2011. Website. Latham, Don. “Discipline and Its Discontents: A Foucauldian Reading of the Giver.” Children’s Literature 32 (2004): 134-151. Muse. Accessed March 2, 2011. Website. Lowry, Lois. 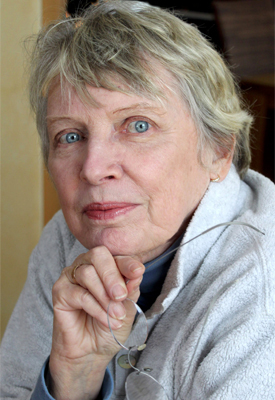 “A Conversation with Lois Lowry.” In Gathering Blue, 4-7. New York: Dell Laurel-Leaf, 2000. Print. ———. Gathering Blue. New York: Dell Laurel-Leaf, 2000. Print. ———. The Giver. New York: Bantam Doubleday Dell Books for Young Readers, 1993. Print. ———. Messenger. New York: Walter Lorrain Books, 2004. Print. ———. Son. New York: Houghton Mifflin Harcourt, 2012. Print. Margolis, Rick. “The Last Battle: With Mockingjay on Its Way, Suzanne Collins Weighs In on Katniss and the Capitol.” School Library Journal, August 1, 2010. Accessed January 6, 2011. Website. Moylan, Tom. Scraps of the Untainted Sky: Science Fiction, Utopia, Dystopia. Cumnor Hill, Oxford, England: Westview, 2000. Print. National Center for Children in Poverty. “Child Poverty.” Columbia University, Mailman School of Public Health. Accessed May 11, 2011. Website. Sargent, Lyman Tower. “The Three Faces of Utopianism Revisited.” Utopian Studies 5:1 (1994): 1-37. Print. Silvey, Anita. “The Edwards Award-Winner Talks about The Giver’s Controversial Past and, Yes, Its Enigmatic Ending.” School Library Journal, 2007, n.p. Accessed December 14, 2010. Website. Stewart, Susan Louise. “A Return to Normal: Lois Lowry’s The Giver.” The Lion and the Unicorn 31:1 (2007): 21-35. Print. Tanenhaus, Sam. “Book Review Podcast: Suzanne Collins.” New York Times, August 27, 2010. Website. United States Department of Agriculture. “Food Security in the United States: Key Statistics and Graphics.” January 15, 2011. Accessed May 11, 2011. Website.